. . . DE8MSH - THE SHORTWAVE LISTENER STATION . . .: DMR with DSD on Bananapi? DMR with DSD on Bananapi? On RTL-SDR addicted blog RTL-SDR.com I read about how to build DSD (Digital Speech Decoder Toolchain) on Linux. Therefore I tried to deocode DMR with this toolchain on Bananapi. The question that has to be answered was: has Bananapi enough power to receive DMR broadcasts and decode data stream with DSD same time? The answer is: almost. Even if Bananapi has two CPU cores with about 1GHz something seems to be not right. As you can see Bananapi takes "only" 70% CPU on both cores. But the result of the decoded datastream exported as wav file is, uhm, very choppy. 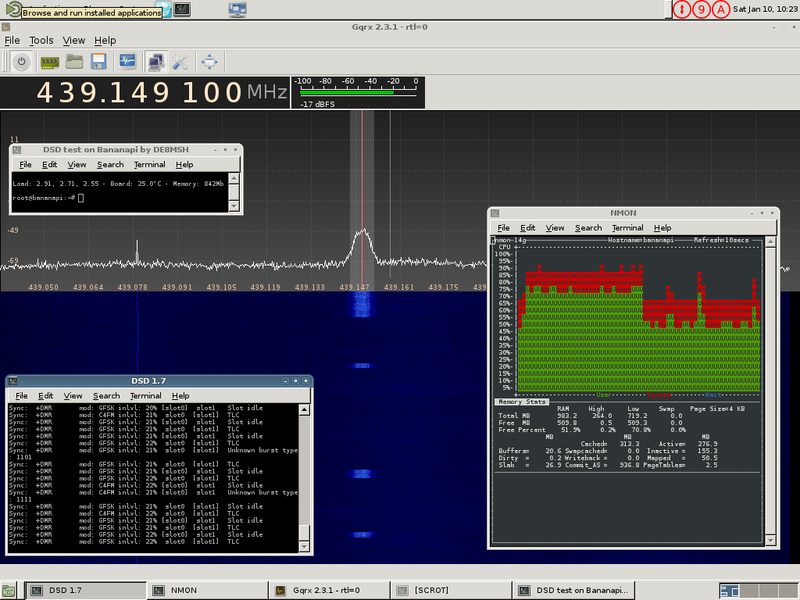 DMR transmisison in "choppy mode"
I don't think that problem is power of the signal itself. It's about 20dB above noise.